Perfection in every detail—Chef Tamura’s vivid imagination lifts sushi to an entirely new experience. 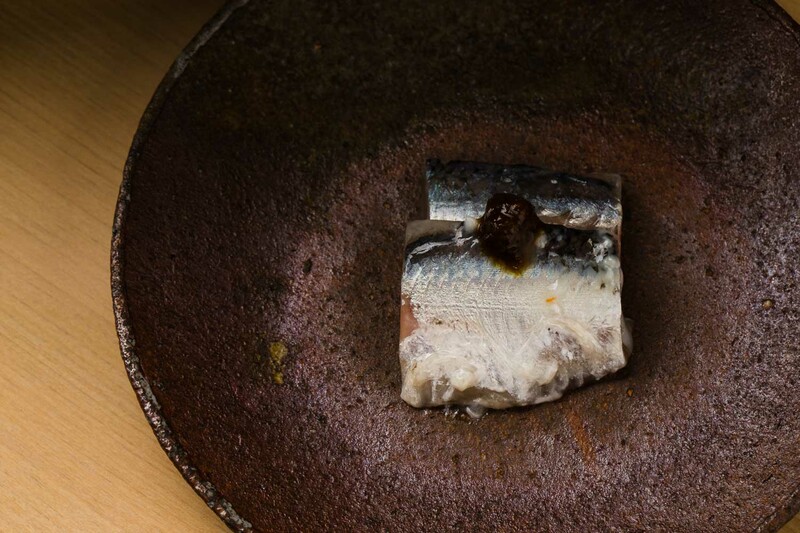 At Wakichi, the two-star Sapporo restaurant, every dish is simple yet powerful, creating an unforgettable course of seasonal harvests through hidden techniques and mastery. Wakichi is located in a quiet neighborhood by Maruyama, a picturesque mountain on the western end of the city. The traditional building is modest and clean, with the soft-lit lantern and light-colored bamboo door creating an inviting escape from a cold wintery night. As you slide the door open, a shimmering crystal fortune cat and a lively cheer welcome the guest. A man with classic round glasses and a soft smile invites you to the grand hinoki wood counter that stretches across the spacious room. 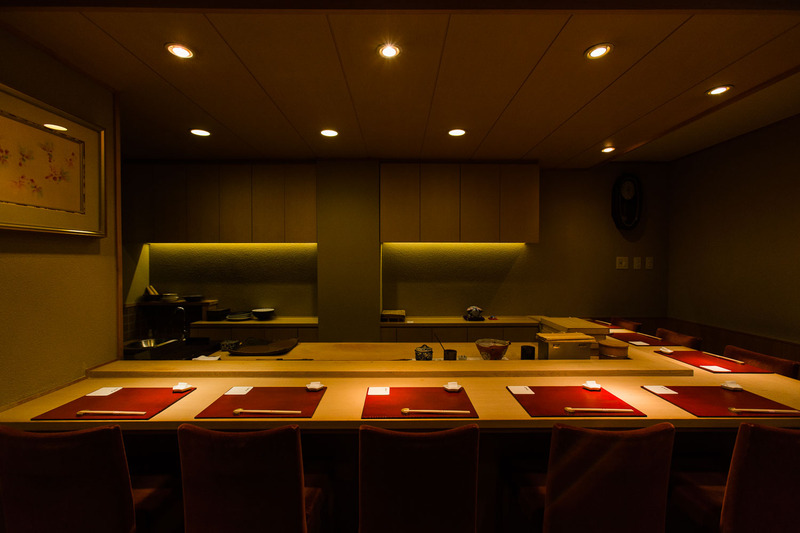 Like the exterior, the decor is simple and minimalist with small spotlights pouring soft rays onto the deep red lacquer trays, perfectly placed for the evening’s eight lucky guests. The clock on the wall behind the counter is a present from Tamura’s mentor, reminding him of the spirit of when he was just starting out. 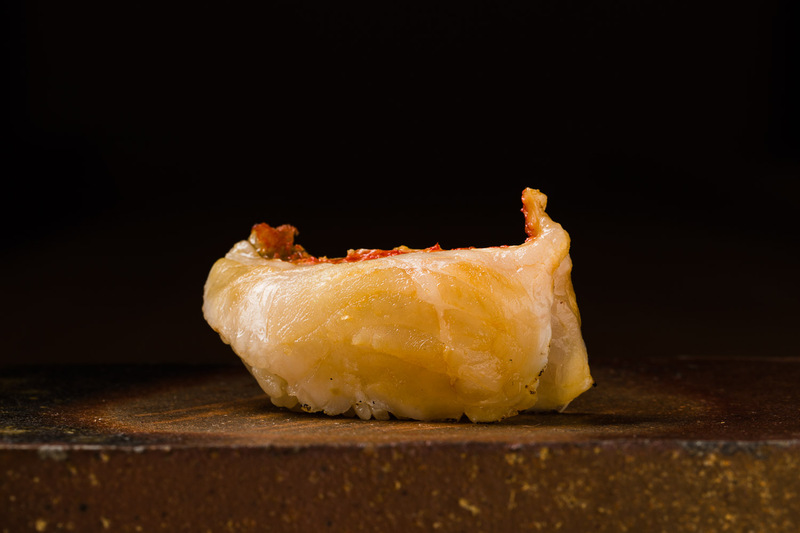 Wakichi’s style is edomae-sushi that begins with a few plates of tsumami appetizers before starting the sushi nigiris. While each dish may look simple, once you place a morsel in your mouth, you will be blown away by its complexity. 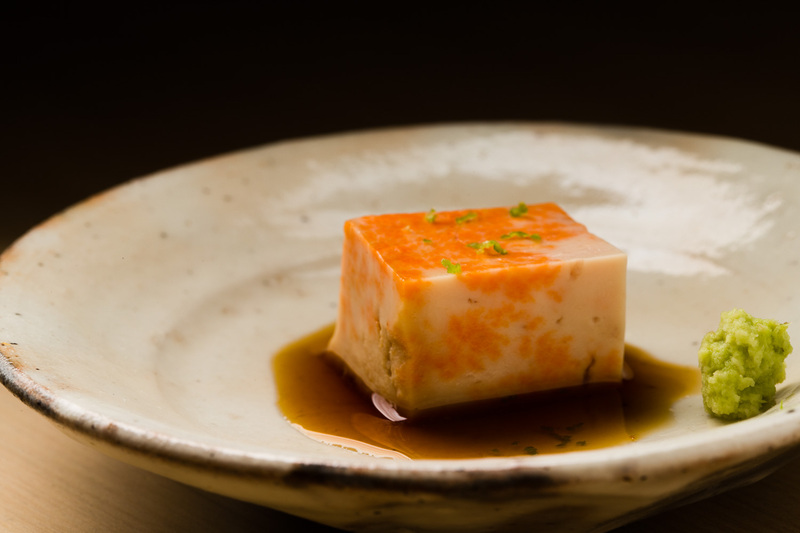 The course opens with the freshest pieces of monkfish liver, so delicate yet potent in flavor. Following is a Hokkaido delicacy called kirikomi, a pudding of gizzard shad marinated in fermented rice, and sprinkled with green chilli. The sweet and buttery fish mix surprisingly well with the tingly spice. 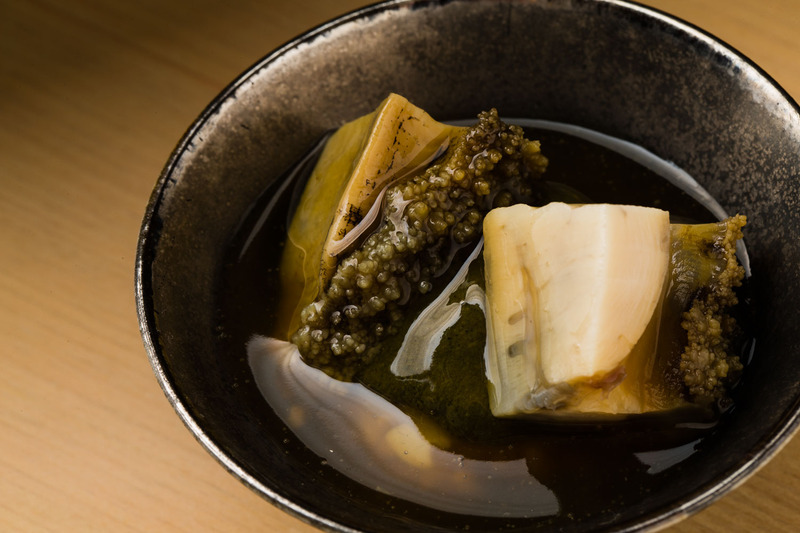 Thick pieces of Hokkaido abalone is steamed in aromatic broth that is thickened using kuzu root starch. At the bottom of the bowl hides a scoop of white rice that has sucked up the rich liver sauce. 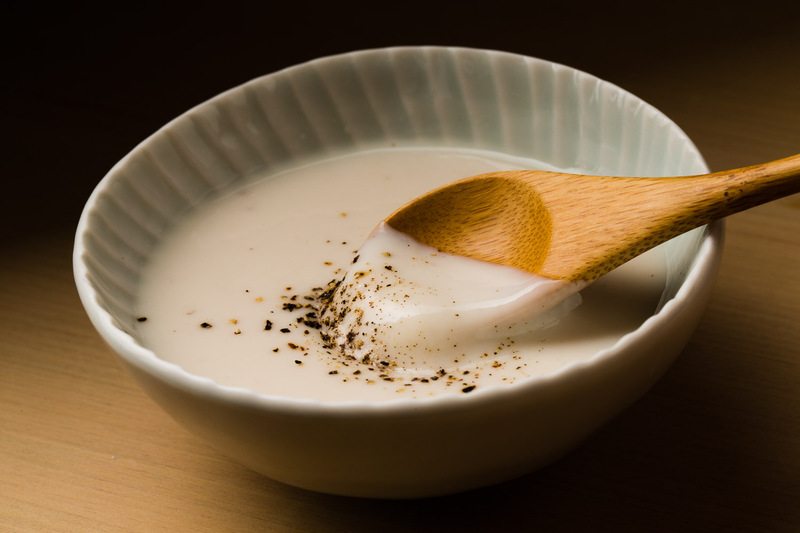 A beautiful cream-colored soup is made of rich cod milt and sprinkled with fresh black pepper. The sushi portion begins with a thick slice of surf clam, with the flavors of the sea bursting in your mouth with every chew. 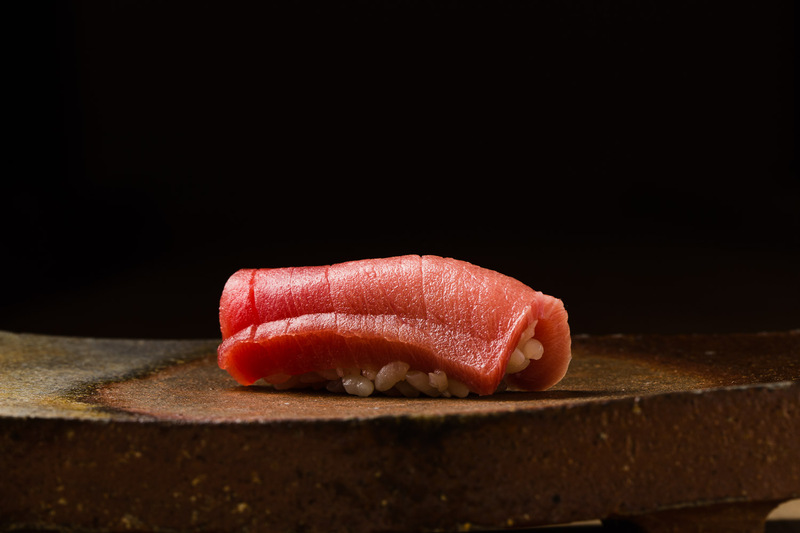 The fatty tuna, so generously cut and enveloped around the shiny white rice, just melts altogether. Seared kinki rockfish is beautiful to the eyes with the bright orange skin lightly burned and curled on the edges. The mountain of the shiniest sea urchins pours over the crisp seaweed belt. As important as the fish itself, the rice is carefully selected and prepared. After many trials and errors, Tamura has resorted to using a blend of older Koshihikari crop from Niigata and new Nanahikari from Hokkaido. The delicate mix of aged rice and new rice creates the right balance for the right consistency. It’s a never ending pursuit to find the right combination as the rice is living, Tamura explains. Tamura’s simple philosophy is to procure whatever best ingredient is available, but he ends up sourcing most of the fish from the Sapporo Central Wholesale Market for great quality and variety. 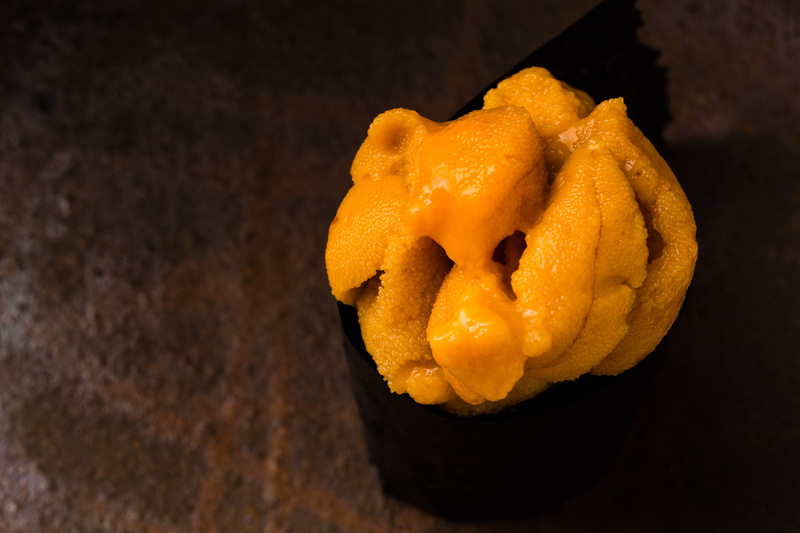 The local favorite is the squid for the summer months, and kinki, monkfish liver, salmon roe, sea urchin and abalone during the winter. 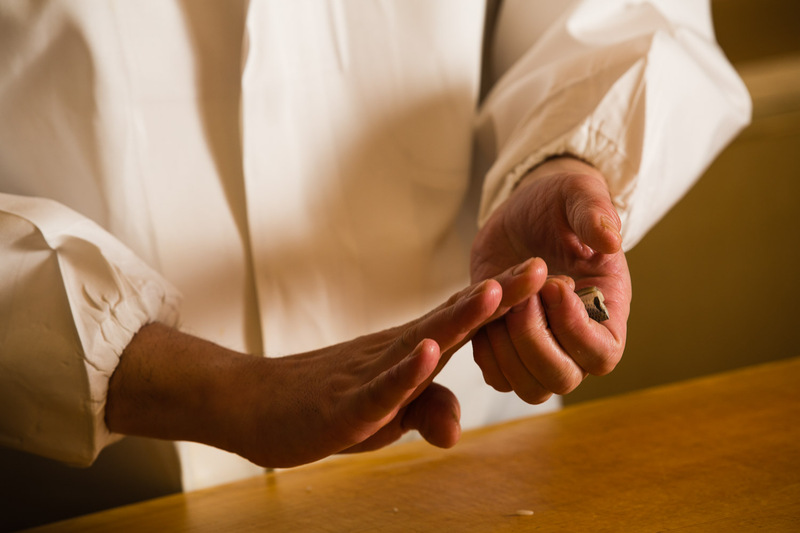 He also keeps a close relationship with a fisherman in Izu in Kanagawa, who is exceptionally skilled at shinkeijime—the process to remove the nerves to keep the fish fresh—and delivers the fish in the best condition. Born in Sapporo, Tamura was raised by parents who worked in architecture, and had little to do with the culinary world. Without much direction on his career, he dropped out of university and headed to Tokyo to help a friend with a new business. When the friend’s project quickly fell through, Tamura had no choice but to take any job out there, and began working at an ordinary sushi place nearby. This was in a way the start of his career in the restaurant business, but nowhere close to where he would end up. The turning point in his life came when he had a taste of an established sushi restaurant for the first time. He was utterly shocked at the immense difference in everything from taste to presentation, and discovered his hidden passion to master the art of sushi. Right away, he began learning at Sushikyu, a renowned sushi restaurants in Tokyo, and re-learned all the basics from scratch. It was Sushikyu’s master chef that gave Tamura the wall clock. But the word about Tamura’s exceptional skills gradually spread, and the restaurant began attracting fans. “It’s a simple recipe,” he answers modestly every time a guest asks him a question about his food. 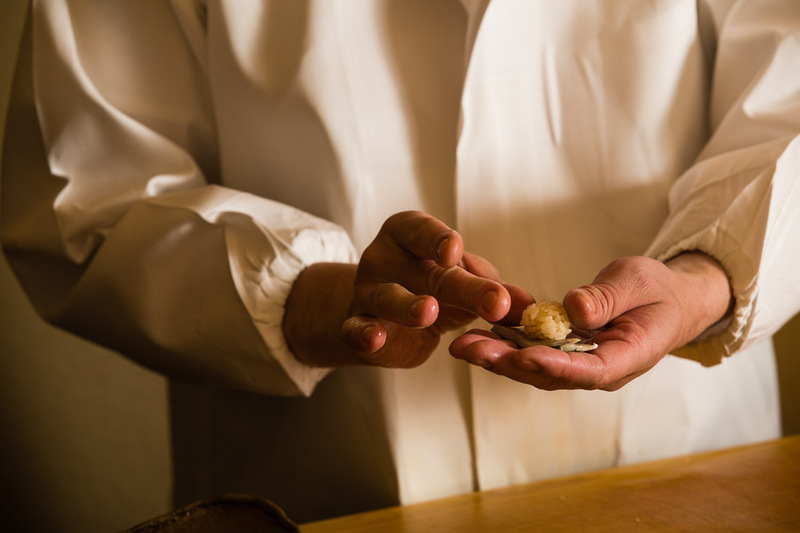 Despite his reserved character, the guests can quickly recognize Tamura’s dedication and competence through the exquisite quality of his dishes. Tamura’s sushi is no ordinary sushi. 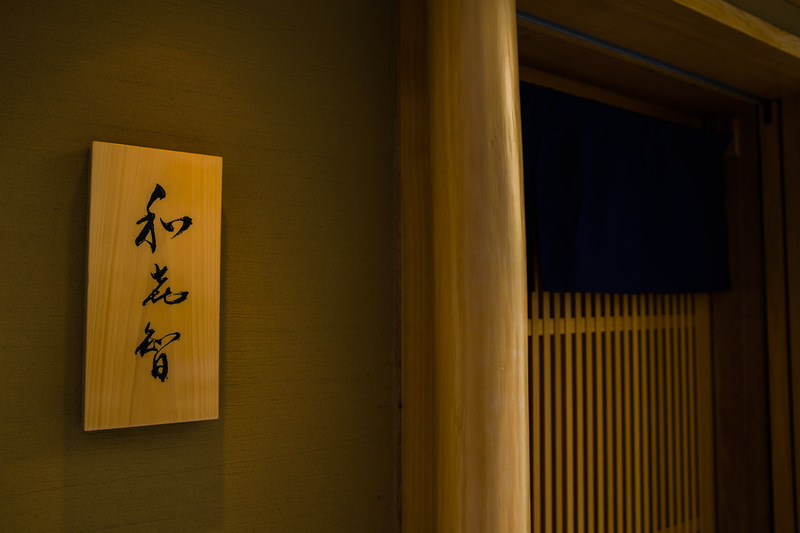 The restaurant’s full name, Sushisai Wakichi, includes the character for vegetables, reflecting his wish to harmonize sushi with all kinds of seasonal treasures. He says his next challenge is to seek for even higher quality fish and add more variations. Not limited to the local seas of Hokkaido, he wants to serve the best fish from across Japan. “I think it would be so exciting if a single slice of sashimi could make a customer rumble,” Tamura says jokingly. 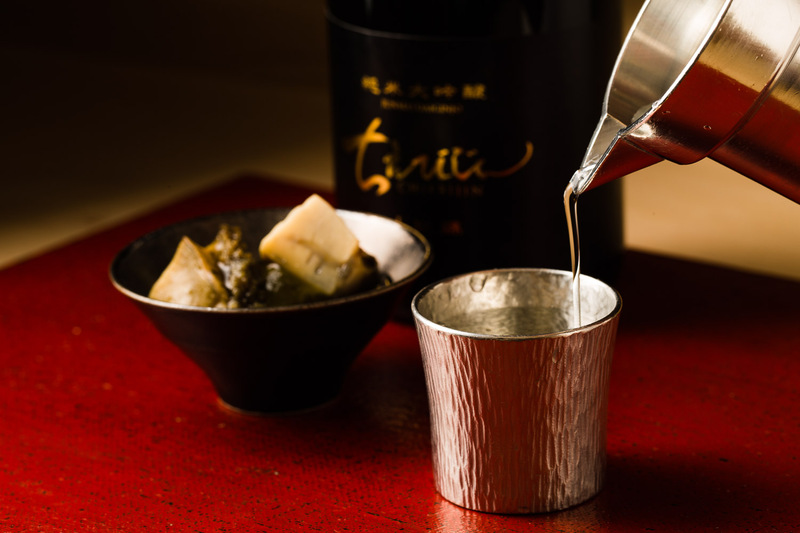 As a lover of the drink himself, Tamura likes to keep a selection of four or so excellent sakes. 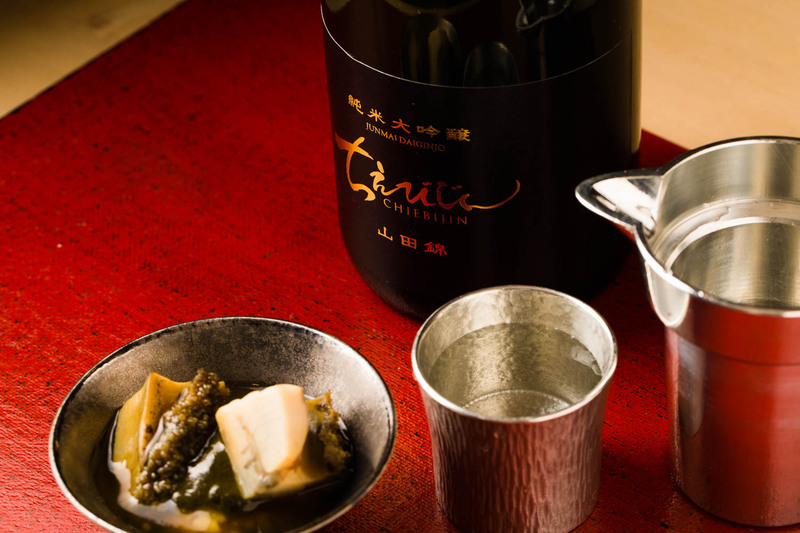 Among his favorites is Chiebijin for its bold and aromatic flavor. Other recommendations include Maruta, a local Hokkaido premium sake, and Jokigen, a light and fruity bottle from Yamagata. 6PM and 8:15PM seating. Lunch is open only on Sundays.